So, what did I do this weekend? Finish the baby quilt? Get going on my winter coat? Sew up my Hot Patterns pants? No, no, and no. I’ll admit that I have ADD when it comes to sewing projects – every day I have a new obsession. I’m unpredictable like that! I spent a fair chunk of time making my Halloween costume that I wore Saturday evening, but I’ll show that project to you on Wednesday. I spent Sunday making up two fun and easy knit garments. I just received my first-ever order from Fabric Mart, and I’m proud to say that I’ve already used two of the yardages! October 2005 is one of my favorite past issues of BWOF; this is from back when I subscribed and didn’t sew a thing from it. Better late than never. A medium weight cotton/lycra knit, cream with flecks of grey, from Fabric Mart. I omitted the 1” bands at the sleeve hem and instead finished them by turning under the cuff and topstitching with a twin needle. I added 2” to the sleeve length. Comfortable & easy to wear top. 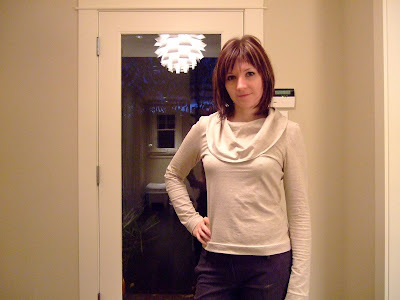 The drapey cowl neck is a look I’ve always liked. Next time I make this I will add ~2” to the bodice length. 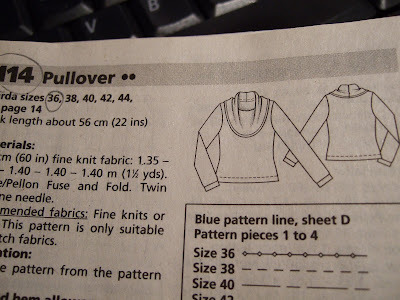 Burda 8771 is a now out of print pattern that I got in 2001 when I first started sewing. Every year since then I have pulled out this pattern and thought about making it up. I don’t know what was stopping me. I used grey “washable organic wool” with polyester backing from Fabric Mart. Now, I’m thinking the polyester backing kind of kills any organic-ness of the natural fiber, but I’ll take it. I threw it in the washing machine and dryer as recommended; it turned out fine. I traced my usual 36/38 morph (36 above waist, 38 below). I made the shorter dress length with the longer sleeves. Omitted the patch pocket. Set the sleeves in flat. Because this fabric doesn’t fray, I didn’t finish the seam allowances. With only 4 pattern pieces so this is super fast to sew up. 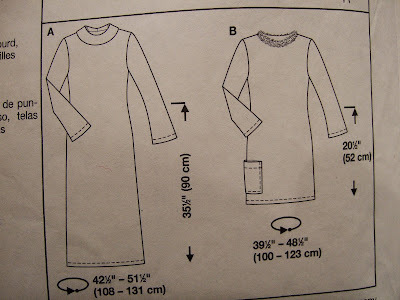 I was really surprised that neither the envelope nor the paper instructions provide a technical line drawing of the back view of this dress, especially considering this is a pattern intended for beginning sewers. It wasn’t until I actually started sewing up the garment that I realized the back of the collar is not the same as the front! 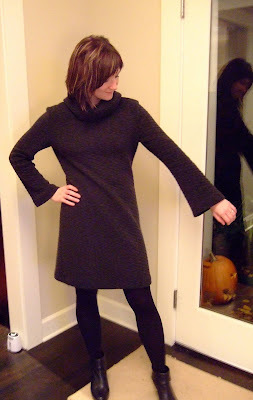 I had assumed that it was just a kind of turtleneck/cowl look all the way around, but I was surprised and pleased to find that this dress has a “backward” collar, very similar to the popular BWOF 9-2007-117. The construction is different though, and I’m thankful I had the instructions to walk me through that. Can I gush a little and say that I love this dress? 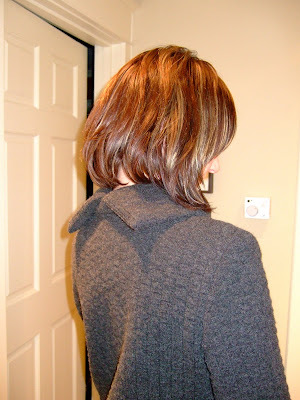 It’s super cozy, the shape of the back collar is unexpected, and the sleeves have a slight bell shape – enough to be noticed but not so much that they flop all over the place. Next time I’ll consider adding in-seam pockets. You had a busy and very productive weekend! I love the top, but most of all I love the dress! You can gush all you want. The dress and top look great! I'm in love with both garments! Wonderful job! What a productive weekend for you!! I can't wait to see your halloween costume!! I really love the top and need to check if I have that issue, too! The cowl neck is lovely. The dress looks fantastic and warm! The fabric is great. Never mind if you haven't progressed what you were planning. Two additions to your wardrobe - I call that productive! Very cute top and dress. I love them both and they look terrific on you. WOW! Seems like you're mastering marathon now. I love both garment you made with a special mention for the dress. It's so, so uh so uh wow. I love it! Both of these items look really great on you. The style of the dress is great, perfect for those days when squeezing into jeans is a no-no. You have been a disiplined girl, I love the top and the dress! Your knit garment are so on point. Can you recommend some reading material for sewing knit. I'm venturing into make a knit dress. I love it all, especially the top! I need to get a hold of that issue. You *astonish* me with your productivity! I am still such a slower sewer but seeing such wonderful completed projects is truly inspiring. What a great dress. Very comfortable but so stylish!! I LOVE your geisha costume!! That was awesome. LOL. You have had a busy week! Wowo, love both your FOs!!! The dress is spectacular! Well done!